Madeline Haeg of St. Joseph has been named to the fall semester dean’s list at the University of Minnesota Crookston. To qualify, a student must attain a minimum 3.66 grade-point average. Emily Boysen of St. Joseph has been named to the fall semester dean’s list at Augustana University, Sioux Falls, S.D. The dean’s list recognizes full-time students with a minimum 3.5 grade-point average. Hillel Hinton-Williams of St. Joseph has been accepted for admission for the 2019-20 academic year to Luther College, Decorah, Iowa. Hinton-Williams has been awarded the President’s Scholarship. American Legion Post 328 of St. Joseph honored World War II veterans at a membership dinner attended by 100 members on Jan. 12. 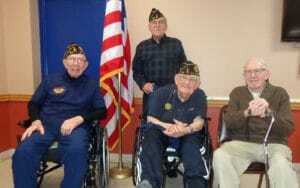 Four of the 11 living World War II veterans were able to attend. The four World War II veterans in attendance were Othmar Schmitz, Don Schneider, Larry Tillemans and Bob Wahlstrom. Schmitz has been a Legionnaire for 69 years, Schneider for 45 years, Tillemans for 52 years and Wahlstrom for 36 years. World War II members of Post 328 who were unable to attend were Harold Gerlich, Richard Pike, Edwin Reber, John Schindler, Lee Schroeder, Oswald Thelen and Joseph Zimmer. Three St. Joseph students have been named to the fall semester dean’s list at the College of St. Scholastica in Duluth. They are Maxwell Botz, Tyler Johnson and Courtney Thielen. Dean’s list members have achieved a minimum 3.75 grade-point average. Fifteen St. Jospeh students have been recognized for fall semester academic achievement at St. Cloud Technical & Community College. To be named to the president’s list a student must achieve a grade-point average of 4.0. To be named to the dean’s list, a student must maintain a grade-point average of 3.5 to 3.99. President’s list students are: Sommer Davidson, Charles Reber, Elena Drake, Brianna Gill, Kevin Huichapa, Lauren Kappes, Mykaela Kappes and Mitchell Lowell. Dean’s list students are: Mitchell Jaeckels, Alexander Legatt, Cameron Knudsen, Abigail Notsch, Emily Notsch, Rose Phillipp and Amanda Symalla.